On Now through September 15! 5. What was the name of the single “supercontinent” from which modern-day continents are believed to have formed? 6. Which planet’s two moons are named Phobos and Deimos? 7. What group topped the charts in the U.S. and U.K. with “If you Leave Me Now” in 1976? 8. Who was the first explorer to circumnavigate the globe? 1. On which day of the week do more heart attacks occur than any other day of the week? 2. How many times does an average resting heart beat in a minute? 3. How many ounces of blood does each contraction of the heart push out? 4. How fast (feet/second) is blood moving when it exits the heart? TELL TALE HEART •	Heart disease is the number one killer of men and women. About a quarter of a million women will have a serious heart attack this year. It's true that estrogen gives women a healthy edge in fighting heart disease, but after menopause, the risk increases yearly till women are equal with men. Between the ages of 45 and 65, one out of nine women will show symptoms of heart disease, compared to one in seven men. But after age 65, the ratio jumps to one in three, which is equal to that of men. However, studies have shown that in the first weeks following a heart attack, women are twice as likely to die as men. Furthermore, more women die during bypass surgery than do men. Why? •	Some doctors say it's due to a combination of factors. One is that when men go to a doctor and complain of chest pains, doctors automatically think of heart disease. But when women complain of chest pains, doctors may still think of heart trouble as a "man's disease" and will look for other causes first. Furthermore, some doctors tend to think of women as having more psychosomatic illnesses than men. Women too are at fault, for a study has shown that they tend to wait longer than men before going to the hospital for help, increasing their chance of complications. •	One cardiovascular surgeon theorizes that another reason more women die during bypass surgery is because they have proportionately smaller arteries, making the surgery more difficult. •	Men suffer heart attacks an average of ten years earlier in life than women, but women are twice as likely to die from their first heart attack as men. •	It's estimated that 90% of heart disease could have been prevented. 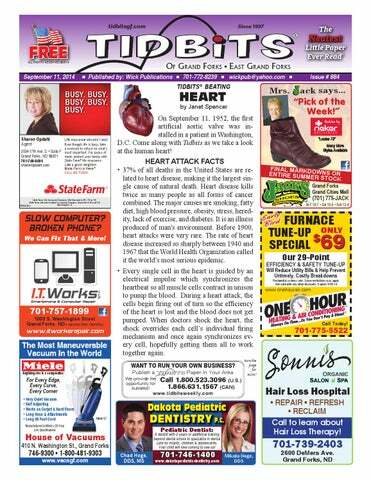 •	On average, one person dies of a heart attack every minute in the U.S.
SPORTS QUIZ 1. What decade was the last time four players were elected in the same year by the Baseball Writer’s Association of America to the Hall of Fame? 2. In their first 10 seasons in the major leagues, how many times did the Arizona Diamondbacks win at least 90 games? 3. Who was the last wide receiver to win a Heisman Trophy? 4. How many consecutive seasons did Dwight Howard lead the NBA in defensive rebounds before the Clippers’ DeAndre Jordan took the top spot in 2013-14? 5. The Boston Bruins won the Presidents’ Trophy in the 2013-14 season for the best NHL regular-season record. How many other times have the Bruins won it? 6. Name the last U.S. men’s hockey player to have a hat trick in an Olympic hockey game? For those Veterans seeking tutoring help (free classroom or on-line courses) or advisement on programs such as the GI-Bill or Vocational Rehab we are the place to start! HEART OF THE PROBLEM •	About 600,000 Americans die of heart attacks each year. 350,000 of them die before they can even reach a hospital. •	Cardiovascular problems are responsible for over half the deaths of people over age 65. •	A quarter of the people who die of heart attacks show no previous sign of disease. •	Stress plays a role in 70% of all illnesses. People under stress are six times as likely to have a heart attack as those under little stress. •	The heart of a typical alcoholic may be twice the size it should be. •	Smoking is responsible for 100,000 deaths from lung cancer and 170,000 deaths from heart attacks each year. CUTTING THE RISKS •	People with coronary heart disease are 30% less likely to suffer from blocked arteries if they regularly take naps during the day. •	Females who jog an average of 27 miles per week are sick an average of two days per year, compared to eleven sick days for female non-runners. Male runners missed an average of 1.5 days per year compared to 4.4 sick days for male non-runners. •	People who work in factories with high noise levels have higher rates of cardiovascular disease, digestive disorders, and circulatory problems than those with quieter workplaces. •	A study of 45,000 men done by the Harvard University School of Public Health showed coffee does not increase the risk of heart attack or stroke as long as fewer than six cups per day are consumed. •	Smoking cigarettes and drinking coffee at the same time raises the blood pressure. The combination of caffeine and nicotine also stops the effects of many high blood pressure medications. This spells danger for those whose blood pressure is already too high. • On Sept. 20, 1975, the Bay City Rollers make their U.S. debut on "Saturday Night Live" with Howard Cosell. The Rollers already were an enormous phenomenon in the U.K., where their every move was greeted by the kind of hysteria not seen • On Sept. 16, 1932, in his cell near since the height of Beatlemania. Bombay, Mohandas Karamchand • On Sept. 18, 1981, the 20,000Gandhi begins a hunger strike car parking lot at Canada's West in protest of the British govern- Edmonton Mall makes the Guinment's decision to separate India's ness Book of World Records as the electoral system by caste. Gan- largest parking lot in the world. The dhi worked all his life to spread his West Edmonton Mall's parking-lot own brand of passive resistance. record will soon be broken. In Dubai, • On Sept. 15, 1954, the famous pic- a 40,000-space parking lot is under ture of Marilyn Monroe, laughing as construction at a shopping center. • On Sept. 17, 1884, Judge Allen disposes of 13 criminal cases on his docket in only six minutes. A defendant in Oakland, California's criminal court did not stand much of a chance of gaining an acquittal. In a 40-year period, only 1 defendant in 100 was acquitted. her skirt is blown up by the blast from a subway vent, is shot. The scene infuriated her husband, Joe DiMaggio, and the couple divorced shortly afterward. • On Sept. 21, 1968, Jeannie C. Riley is the first woman to top the Country and Pop charts simultaneously. "Harper Valley P.T.A." was her first professional demo, which was released as a single. Eventually Riley became a born-again Christian and refused to perform her biggest career hit. © 2014 King Features Synd., Inc.
• On Sept. 19, 1995, a manifesto by the Unabomber is published by The New York Times and Washington Post in the hope that someone will recognize the person who, for 17 years, killed and maimed innocent people by sending homemade bombs through the mail. David Kaczynski linked the writing style to that of his older brother Ted, who was later convicted of the attacks and sentenced to life in prison without parole. FAST FACTS •	In 1933 at the age of 58, Wilson Mizner had a heart attack in Hollywood, where he was a screen writer. When he regained consciousness, he was asked if he wanted to see a priest. "I want to see a priest, a rabbi, and a Protestant clergyman," he said. "I want to hedge my bets!" When a priest came to his deathbed, Mizner waved him away, saying, "Why should I talk to you? I've just been talking to your boss!" He died shortly afterwards, reportedly with a smile. •	Walter Matthau had a heart attack in the middle of filming The Fortune Cookie in 1966. He resumed filming five months later. In the movie, he goes out the door and comes back in again forty pounds lighter. •	In 1975 Philadelphians re-elected Francis O'Donnell to the city council even though he had died of a heart attack a week earlier. There wasn't time to change the ballots. •	In 1973 two white cops in New York were giving mouth-to-mouth to a Puerto Rican woman who had suffered a heart attack and collapsed. A crowd of Puerto Ricans gathered and thought the cops were assaulting the woman. The policemen didn't speak Spanish and the Puerto Ricans didn't speak English. The mob beat the two cops. •	Les Boatwright died of a heart attack a week before the Super Bowl XXIII game, to which he had two tickets. Knowing he wouldn't want to miss the game, his two sons took the tickets, and his ashes, to the game. •	Giuseppe De Mai was born with two hearts beating in his chest. In 1894 he signed a contract with the London Academy of Medicine, and was paid $15,000 for permission to study his hearts after his death. THE FINAL FACT •	Rabbits who were cuddled for one hour a day suffered one-third the amount of heart disease as rabbits who received no cuddles. cated on publicati the racks nea on r th Exit doors e ! • Rims & Tires • Auto Starts • Bug Deflectors • Grille Guards • DVD Headrests • Hitches • & Much More! •	John Hopps was born in Winnipeg in 1919. After receiving a degree in electrical engineering from the University of Manitoba in 1941, he joined the National Research Council of Canada (NRC) in 1942. He was researching hypothermia and experimenting with radio frequency heating to restore body temperature when he came to the attention of Dr. Wilfred Bigelow and Dr. John Callaghan at the Banting Institute in the University of Toronto. •	This team of surgeons was researching methods of heart surgery. Dr. Bigelow believed that the only way cardiovascular medicine could advance was by enabling open-heart surgery. Based on his experience as a field medic during World War II, he was convinced that cooling the body and slowing the heart rate was the way to go. One of the challenges the surgeons faced was keeping the heart beating while the body was hypothermic. During an experimental surgery on a dog, they noticed that stimulating a stopped heart with an electrical probe could restart it, and that sending pulses of electrical current could actually change the heart’s rate. It was “a tremendous bit of good fortune,” said Dr. Bigelow in an interview about the discovery with the Canadian Medical Hall of Fame. To turn this discovery into a clinical device, they recruited John Hopps. •	John Hopps went to work designing the world's first pacemaker. The first model, an external pacemaker developed in 1951, was about the size of a shoebox and needed to be plugged into an electrical outlet to work. It used vacuum tubes to generate electrical pulses. An insulated wire inserted through the jugular vein delivered the electric shocks to the right atrium of the heart. These shocks provided the artificial pacing. •	It would be another ten years before internal pacemakers became a reality. The turning point was the invention of small silicon transistors to replace vacuum tubes. This technology allowed pacemakers to become small enough to be implanted in the body. •	The first recipient of an internal pacemaker was Arne Larsson of Sweden in 1958. The prototype was about the size of a tin of shoe polish. Over his lifetime, Mr. Larsson received 28 devices and lived to the age of 86. •	Today’s pacemakers are about the size of a USB stick. They may be as small as one inch in diameter and weigh as little as 0.5 oz. Pacemaker surgery is usually performed in less than an hour under a local anesthetic. In addition to being smaller, modern pacemakers are far more complex. Programmable pacemakers were introduced in the 1970s that allowed doctors to choose different pulse speeds and durations. Modern pacemakers include microprocessors that collect data about how well the heart and pacemaker are working. These microprocessors can also monitor the patient’s physical activity and adjust the heartbeat as needed. Some pacemakers can even restart the heart if it stops. •	Dr. Hopps retired in 1979. Ironically enough, in 1984 he himself became a recipient of a pacemaker. By this point, inserting a pacemaker was considered to be routine surgery. His pacemaker lasted 13 years, at which time he received a new one. When his brother also needed a pacemaker, Hopps insisted his sibling pay him a royalty, but he refused to cough up. Hopps died in 1998 after seeing his invention save thousands of lives. •	Today the Canadian company Mitel is the world's largest manufacturer for the inside parts of the pacemaker. H Easy HH Moderate HHH Yowza © 2014 King Features Synd., Inc.
GRAPHIC NOVELS Expires 9-30-14 © 2014 King Features Synd., World rights reserved. Medicare plans made simple. For more call Medica’s Center for Healthy at 1-800-906-5432. 8 a.m. For moreinformation, information, call Medica’s CenterAging for toll-free Healthy AgingSM toll-free atto 8 p.m CT, 7 days a week. TTY users, please call the National Relay Center at 1-800-855-2880. You must continue to 1-800-906-5432, 8 a.m. to 8 p.m. CT, 7 days a week. TTY users, please pay your Medicare Part B premium. Medica is a Cost plan with a Medicare contract. Enrollment in call Medica depends on contract renewal. Y0088_3450 CMS Accepted. You must continue to pay © 2013 Medica the National Relay Center at 1-800-855-2880. your Medicare Part B premium. Medica is a Cost plan with a Medicare contract. Enrollment in Medica depends on contract renewal. Y0088_3450 CMS Accepted © 2013 Medica. •	Garlic contains 33 sulfur compounds, 17 amino acids, germanium, selenium, various minerals, and vitamins A, B1, and C. It has only two calories per clove, is fat free, and very low in sodium. •	In a trial that pitted garlic against the cholesterol-lowering drug called Bezafibrate, garlic turned out to be just as effective as the medicine. A study reported in the British medical journal Lancet proved that after taking nine cloves of garlic, cholesterol dropped by seven percent. •	Volunteer diners had their cholesterol checked before a meal. The average cholesterol level was 221.4 before dining. Then they were fed a meal containing a total of 1/4 pound of butter. Three hours later, the average cholesterol level was up to 237.4. But when the same meal was given again, this time along with the oil from 50 grams of garlic added to the recipe, the average cholesterol level dropped to 212.7, which was lower than before the test subjects had even begun eating. DIFFERENCES: 1. Shade is moved. 2. Shirt is different. 3. Picture is missing. 4. Dish is smaller. 5. Collar is different. 6. Pot is missing. © 2014 King Features Synd., All rights reserved. ticed the in problems that432 farmers when •	One study India took peoplefaced who had reattempting to till soil. Because the area had cently had heart attacks. Half were given garlic been the placebos. soil was After rich oilformerly daily and halfwoodland, were given withyears, hummus, clung to three thosewhich takingclumped the dailyand garlic oil sufthe blades of the plows farmers were accusfered 35 percent fewer secondary heart attacks tomed to using. While repairing a broken cirand 45 percent fewer deaths than those taking cular saw, Deere stumbled upon an idea. He the placebos. A study of over 40,000 women employed his smith skills to fashion the steel inblade Iowa into foundthethat thoseofwho ate garlic at least shape a plow. He affixed once week had a 35%then lower chance getting twoawooden spokes, hitched theofdevice colon cancer than those who ate no garlic all. to a horse. It plowed the heavy Illinois at soil a charm. In fact, farmergarlic who happened •	Alike group of people werea given every day be observing the test run immediately put forto three weeks. Then white blood cells were in an order for his own John Deere plow. taken from the test subjects and placed in a lab containing Theblacksmith garlic-eat•dish In short order, cancerous Deere gavecells. up his er's white blood cells killed off more than twice shop and focused on making plows. The ascompany many tumor as did cells grew cells steadily and white added blood many employees. In who the late John relocated the from people ate 1840s, no garlic. entiredifferent operation to Moline, Illinois. •	Three groups of toads wereAshamed fed either of his own lack of education, John sent his freshly minced garlic, garlic oil, or corn oil (as a children to the state’s finest schools. One of placebo) for four months before being exposed his proudest days occurred when son Charles toearned aflatoxin B1, which is a food contaminant the equivalent of an MBA from Bell’s known to causeCollege liver cancer. Only three percent Commercial in Chicago. of the toads fed minced garlic and nine percent •fed With his son Charles managing company,19 garlic oil developed tumors.the However, John found time pursue philanthropic inpercent of those fedtocorn oil developed cancer. terests. He co-founded both the First Nation•	Even though studies have shownChurch. positive al Bank andmany the First Congregational results from garlic, is still of illegal in the He was elected theit mayor Moline in U.S. 1873,to make any medical claims concerning its health where one of his first actions – the replacebenefits. is also to getwith federal fundment ofItthe city’sdifficult open drains a sewer pipe – saved countless by reducing forsystem additional studies, and lives pharmaceutical ing the spread disease. to explore research companies are of reluctant natural •into Thewidely originalavailable John Deere logo,substances registered that in cannot be patented. 1876, depicted a deer that was native to Africa. Thirty-six years later, in 1912, it was re•	Garlic may interact with a variety of medications placed withanti-hypertensives, the image of a North American including hypoglycemic white-tailed deer. In the decades foldrugs, Warfarin, and antibiotics such asthat Cipro. lowed, the now-familiar “outline” logo took Thanks for Reading over as the symbol of the John Tidbits! Deere brand. Information in the Tidbits® Paper is gathered from sources considered to be reliable, but the accuracy of all information cannot be guaranteed. 1. Mondays 2. 60-100 3. About 2 ounces 4. 80 ft./sec. GOES LONG.... Jerry Robinson was serving a life sentence in Auburn, New York, for the murder of two police officers. During open-heart surgery, his heart stopped beating two minutes. Afterwards he petitioned to be released from prison because his natural life had ended when his heart stopped. His petition was denied. "Heart," "John Hopps" and "Great is Garlic"